In the computer lab of a university campus, an eerie green glow emanating from the fluorescent lights overhead, an unlikely romance forms between two graduate students, a nerdy computer science student named Elliot and fellow graduate student Molly, who’s studying molecular biology through the study of yeast cultures. Part of the trouble is that both are already entangled. Elliot is engaged in a rebound relationship with Lauren, and Molly is involved with her advisor Don. The excitement of academic discovery thrusts them together as old ties are shed in favor of a new, thrilling symbiosis. Moses’s play, essentially a romantic comedy, is spry and winning propelled by self-assured dialogue that, while riddled with jargon, lands in the same way Aaron Sorkin’s screenplay for The Social Network does, by assuming its audience will comprehend the trajectory of an interaction, in this case the ebbs and floes of Elliot and Molly’s relationship, even as the rush of scientific detail speeds by. Once our central pair has come firmly together, all is revealed to be not right in scientific paradise. 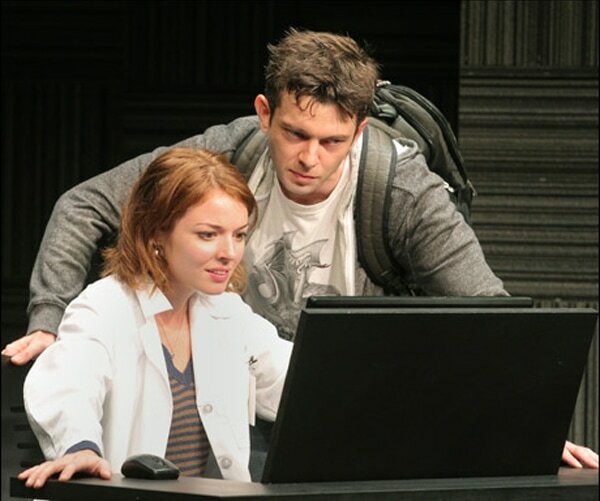 As Elliot searches for a computer program to map Molly’s data, helping her predict test results for lab experiments before they’re executed, they soon find that the titular completeness of their mission depends on the infinite mapping of the network of the experiment, an impossible task. Completeness, a talky and frustratingly wordy play, ultimately proves itself as thrilling as it is smart, mostly because its top-notch script is matched by a fine cast, particularly Karl Miller, who straddles the line between geek and heartthrob perfectly, and Aubrey Dollar, who steals the show as the brilliant, insecure Molly, similarly self-assured and self-doubting. Meredith Forlenza and Brian Avers acquit themselves well in a handful of supporting roles. Director Pam MacKinnon understands the rhythm of playwright Moses’s dialogue, keeping the jargon-laden exchanges ripping at the speed of lightning. She makes particularly expert use of David Zinn’s versatile set, which converts easily from lab to bedroom all the while maintaining the feel of an austere university existence. At the heart of Completeness are two compassionate, isolated individuals. Their intelligence binds them together and, ultimately, forces them apart. Theirs is a relatable duality that emanates from within the heart of Itamar Moses’s smart, heartbreaking new play, which seeks to prove the impossible possibilities of love and ends up winning its audience over in the process.